Is your team always rushing to put out “fires”? Are you having difficulty completing planned maintenance tasks as scheduled? Do you need a planned/preventative maintenance program implemented? Do you need a better way to track expenditures? What about inventory, equipment, breakdowns, repairs, warranties, etc? Do you have an outdated or non-existent CMMS Computerized Maintenance Management System or EAM Enterprise Asset Management system? MaintiMizer Web Edition CMMS is the solution for you! 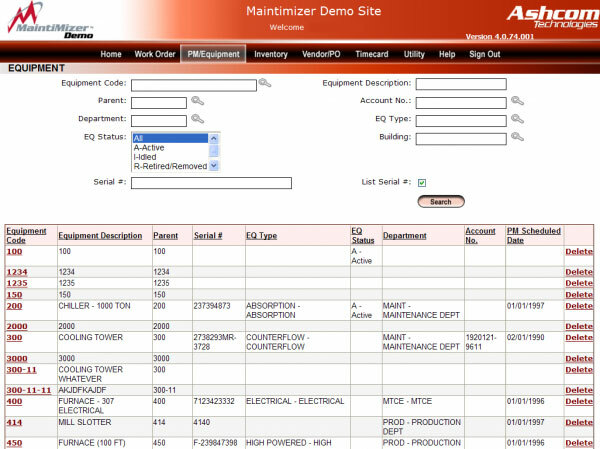 MaintiMizer Web Edition is organized into “modules” that correspond to the most frequently-used maintenance management functions: Work Order, Preventive Maintenance/Equipment, Inventory, Vendor/Purchase Order, and Timecard. (There are also Utility and Help modules to help you manage and learn the system.) You access the modules through the menu bar at the top of each screen. MaintiMizer Web Edition has several practical applications that make it clear that it was designed by people with actual maintenance experience. The weekly schedule workup page shows at a glance exactly what work orders have been scheduled for the upcoming week so maintenance staff can be scheduled efficiently and effectively. Similarly, the daily schedule workup shows exactly what each employee already has scheduled for the day so it’s always clear who is available to take an emergency call. Reporting is at the heart of MaintiMizer Web Edition, and generating reports is easy. The best Preventive Maintenance Software, each module has a number of preset reports that can be generated with one click of the mouse. For example, in the work order module you can create a work order analysis, a backlog review, a craft hour/cost report, a top 20 items recap, an activity summary review, a summary of work order costs, a detailed work order report, a material/labor cost report, and a failure analysis. You can also create your own custom reports. Manage work orders, preventative maintenance schedules and tasks, assets, inventory, and purchase orders. Meet your unique needs; the CMMS system is flexible and fully customizable. Securely access your data from any internet enable device or location. Integrate seamlessly with popular enterprise-wide systems like SAP, PeopleSoft, JD Edwards, or Primax. Report and Analyze trends in data.